Using a television to watch TV is so 20th Century. Screens can do much more these days. 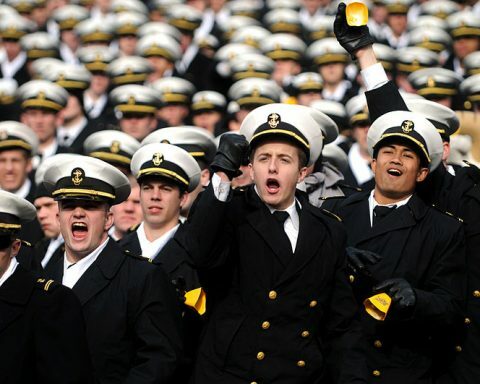 The civilian sector is proving that and the Navy needs to take heed. 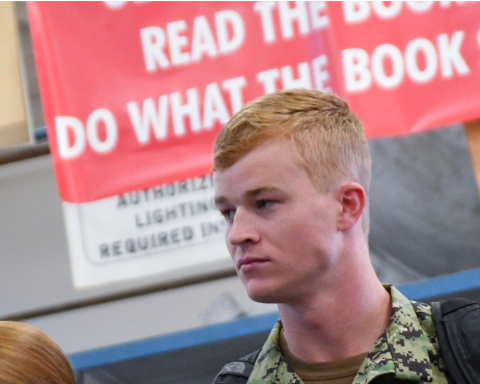 Specifically, the Navy should use electronic displays in new and innovative ways to communicate among its deployed forces, confuse potential enemies, and even disguise its ships and shore facilities. It is not often that one talks about screens as innovative since the television has been commercially available for almost a century, but display technologies have advanced so dramatically since the early days of television that they can now be used cost-effectively for entirely new purposes. Considering the ever tightening budgets looming in the Navy’s future, it would do well to invest in proven technology, like the digital electronic display, and generate operational advantage through creative employment. What if an aircraft carrier could change its hull number at will? Or if a strike group could communicate at high data rates without transmitting a signal? Imagine a warship being able to sail right through an enemy fleet in broad daylight by simulating the appearance of a merchant vessel. These ideas may seem like science fiction, but they are all possible through the use of technologies that are used by millions every day. Digital electronic display technologies, such as light emitting diode (LED), liquid crystal display (LCD), plasma, and digital projection, have advanced and proliferated rapidly in recent years. This has caused unit cost to decrease and quality and capability to increase. These technologies are no longer just for watching television or working on a computer. Massive LED screens are common on digital billboards, while nearly half of all Americans carry high resolution displays in their pockets in the form of smartphones. Displays are even beginning to break out of their traditional rectangular shape. LEDs can now be manufactured so that panels can be flexibly conformed to curved or irregular surfaces. Projection mapping techniques enable projectors to display images on three dimensional surfaces. All of these technologies have the potential to revolutionize the way the Navy operates for pennies on the dollar. Consider the island superstructure on an aircraft carrier. Large white painted hull numbers take up about a quarter of the inboard and outboard faces of the island. They serve one purpose: identify the ship in order to comply with international regulations. The numbers are lined with dozens of light bulbs which can either be turned on or off. Aside from ceremonial ambience, it is difficult to see what value they provide. 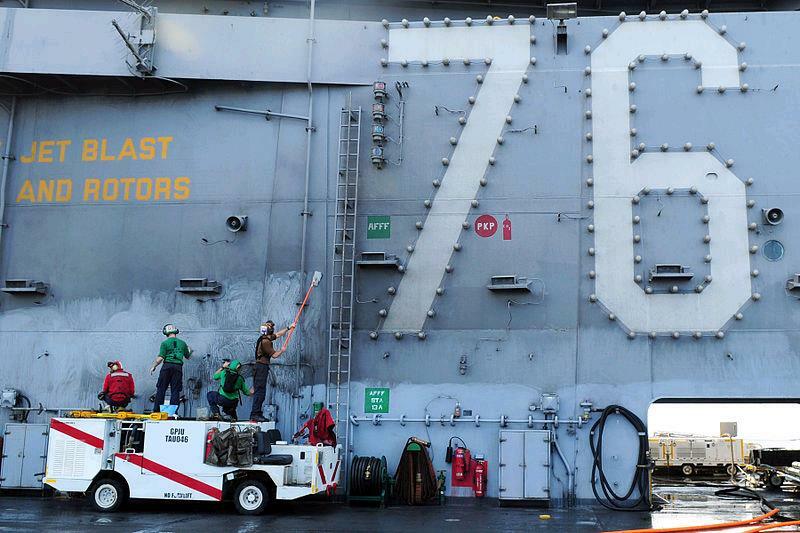 Sailors scrub down the island superstructure on the flight deck of the aircraft carrier USS Ronald Reagan (CVN 76). They could be watching the latest episode of Game of Thrones. 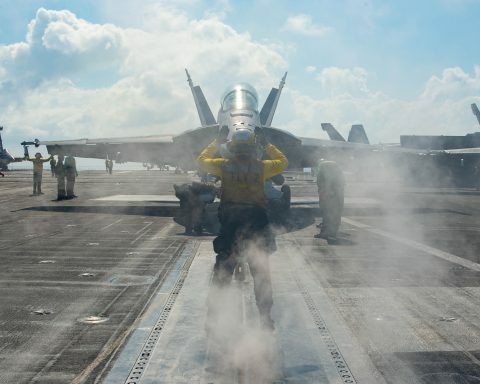 If the lights and the painted numbers were replaced with digital displays, the Commanding Officer of the carrier would have several new options at his or her disposal. For one, the screens could be set to display any hull number or none at all. Obviously, removing or changing hull numbers would not hide the ship, but against a capable and professional enemy it might confuse their decision making process enough to delay or deter an attack. As an example, the US Navy today requires significant confirmation, often visual, to establish and maintain maritime domain awareness (MDA). If the same ship were to be reported in three different locations, mission effectiveness would suffer while watchstanders tried to sort out the discrepancy. Conflicting reports are like poison to a networked force. Even if the superstructure screens were blank, the CO may find advantage in denying the enemy useful intelligence. In World War II, the Pacific Fleet removed visible numbers from aircraft carriers and did not return them until the Japanese were no longer a threat. An island superstructure screen could also be used as a visual aid for flight deck operations. 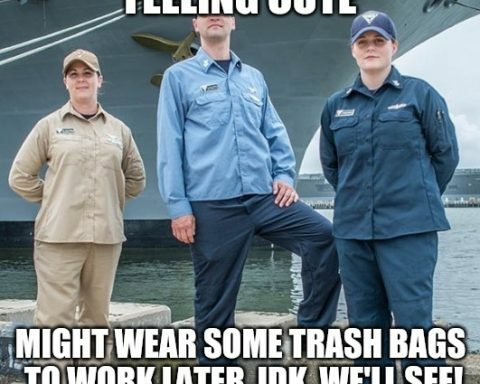 The flight deck of an aircraft carrier is an extremely loud and dangerous work environment. It is often difficult for crews to hear anything but jet noise. Visual messages could supplement audible alarms to indicate emergencies, not only grabbing attention but also relaying critical information. Conversely, an outboard screen could aid in force protection efforts, particularly in precarious situations like anchoring in popular foreign ports. If a wayward sightseer saw his leisure craft on the screen with the word “STOP” written in several different languages, the message would be received loud and clear. Digital displays can also be a cost-effective means of communicating messages over long distances. In an effort to move the Navy away from highly detectable radio communications, optical communication techniques are gaining attention, but they often rely on technologies such as laser, which require more research and development (R&D) investment. Digital displays offer the possibility of optical communications without any R&D required. For example, a popular manufacturing and advertising concept called a quick reaction (QR) code uses a matrix of black and white squares to store data, which can be read by a camera on a smartphone or other computing device. When large digital displays (such as the aforementioned “superstructure screen”) are coupled with high resolution digital cameras (another readily available technology), ships within sight of each other could communicate optically, much like age old flashing light or semaphore techniques, but with much higher data rates. 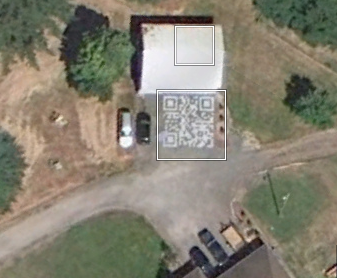 A driveway turned QR code as viewed from space. Using a screen, this house could become a satellite communications node. Since the interpretation of QR codes is automated, data rate is only limited by a computer’s ability to process each new code. Data rate, fidelity, and communications range will only increase as display and camera technologies improve. This concept could easily be applied to satellite communications, as shown above. Communication would depend heavily upon adequate visibility, but this “digital semaphore” technique could offer a cost-effective method of optical communication while recapitalizing some of the capabilities lost by the disestablishment of the Signalman rating in 2003. Perhaps the most ambitious use of digital display technologies would be to disguise an entire ship. Much like “digital semaphore” could revolutionize optical communications at sea, the digital version of deceptive lighting could revolutionize naval deception. Deceptive lighting is a standard technique used by US Navy ships to conceal their identity at night by changing their normal lighting configurations. The effectiveness of deceptive lighting is debatable and, in any case, it offers no cover from the enemy when the sun rises. Digital displays could be used in daylight hours to complete the deception. Research into this concept, called active camouflage, is well underway. In fact, in 2011 BAE released an active camouflage for tanks called Adaptiv© that works in the infrared, not visible, portion of the spectrum. The frames in the image show an armoured vehicle with Adaptiv off (left) and on (right), where the chosen object is a large car. The visible version is not far off. In March 2012, Mercedes Benz made one of their new vehicles nearly invisible by covering it with flexible LED panels that displayed images from a camera on the other side of the vehicle. The aim of active camouflage in naval applications would not be to make a warship invisible, but rather to appear as a different kind of ship not worthy of the enemy’s attention. Displaying a false hull form instead of trying to make the ship invisible actually could reduce some technical challenges of active camouflage, such as the requirement to know the viewer’s look angle in advance. Furthermore, a warship has several other signatures, such as radar return and visible wake, which are impossible to eliminate completely. 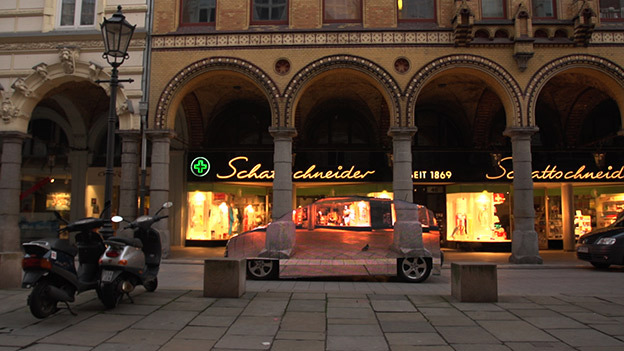 To promote the environmental ‘invisibility’ of the zero-emission, hydrogen-fuelled Mercedes F-Cell, ad agency Jung von Matt covered the car in LED sheets which would display a live video image whatever was behind the car, as filmed by a camera attached to the other side. Although the technology still needs to mature in order to be feasible for use on ships at sea, the concept is simple (indeed BAE is already working hard to apply Adaptiv to warships at sea). A ship’s freeboard and superstructure could be covered in conformal LED paneling to display an image of a merchant or some other vessel, provided it is not protected by international treaties like a hospital ship. Artist rendition of Adaptiv camouflage applied in the maritime domain. Naval active camouflage would be intended to fool routine enemy surveillance from near-horizon distance, not ships in close contact or aircraft conducting targeted search efforts. However, in combination with emissions control (EMCON) and careful maneuver (i.e. staying within shipping lanes and avoiding close approaches to enemy assets), the appearance of a merchant vessel on the horizon would fit the enemy’s expectations and cause him to focus his surveillance efforts elsewhere. Another potential use of naval active camouflage can be found in a historical example. 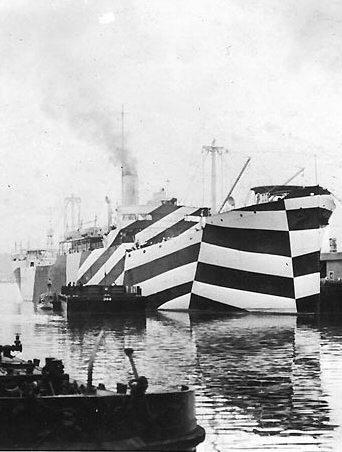 In World Wars I and II, the Allies took inspiration from the art world and painted their ships with irregular patterns of contrasting geometric shapes, called dazzle camouflage, to confuse enemy rangefinders, particularly on submarines. 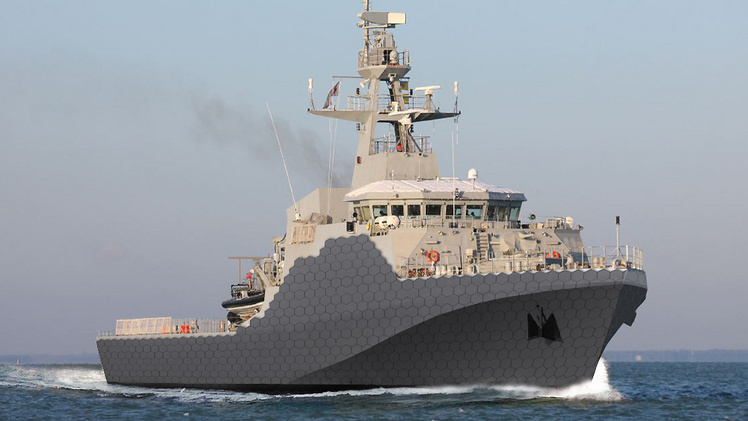 Dazzle camouflage fell out of favor with the advent of radar, but today the digital version could prove valuable, particularly against low end threats. 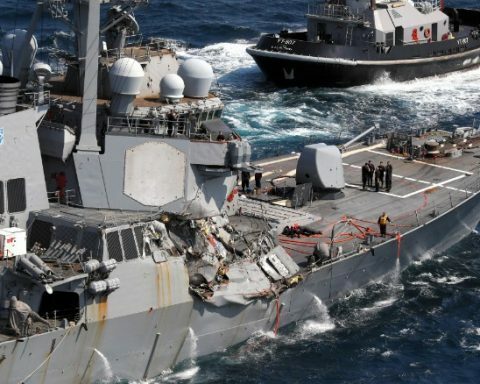 Without advanced fire control radars, terrorists and pirates rely on their vision to target or avoid naval warships, depending on their particular goals. Even without disguising identity, creative use of adaptive camouflage could make it nearly impossible for a threat to determine a warship’s true aspect, just like dazzle camouflage, and consequently, how to engage or maneuver effectively. USS Mahomet (ID-3681) in port, circa November 1918. The ship has a “dazzle” camouflage scheme that distorts the appearance of her bow. Using display technologies to make warships appear as something else is not a completely new concept for the modern US Navy. 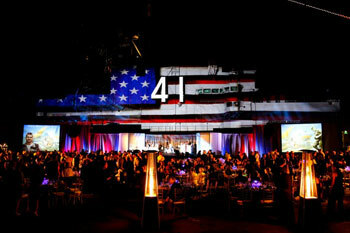 In September 2011 as part of the 5th Annual Midway American Patriot Awards gala, the island superstructure of the USS Midway was transformed into a waving American flag using a different kind of display technology called projection mapping. AV Concepts, Inc. used 3D projectors, advanced graphics software, and creative lighting techniques to virtually “paint” the flag onto the ship with stunning clarity and realism. The American flag virtually draped over USS Midway using projecting mapping technology at the 5th Annual Midway American Patriot Awards. The projection of the flag onto the hull was so precise, some guests thought ship was covered with a flat projection screen. While not an ideal technology for afloat forces, projection mapping could be used to fool optical sensors by blending shore facilities into their surroundings. Again, history provides an intriguing parallel. After the 1941 raid on Pearl Harbor, Lockheed Martin desperately needed to hide its Burbank, CA aircraft plant from Japanese fighters. With the help of nearby Walt Disney Studios, they used canvas, paint, and chicken wire to cover the massive industrial facility with scenery of a quiet rural community. By employing a little artistic creativity, the Burbank plant was able to continue operations throughout the war. Blending this type of creativity with modern display technology could provide cover against today’s more advanced optical sensors. 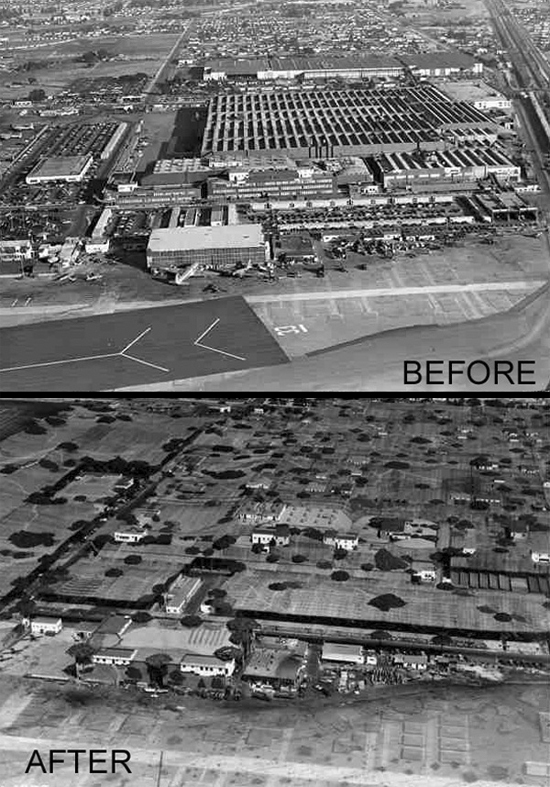 An aircraft manufacturing plant disguised as a suburban Burbank neighborhood during World War II. With modern display and projection technology, the same concept could be applied to counter modern enemy surveillance efforts. The decreasing cost and increasing performance trends of proven display technologies offer the Navy a cost-effective way to generate revolutionary capabilities. Emerging technologies, such as electronic paper (e.g. E Ink® on Amazon’s Kindle®) and phased array optics (think “the Holodeck from Star Trek”), promise to bring even more capabilities into the fold. Certainly, there will be challenges like increased maintenance requirements that must be considered to determine operational feasibility. Also, enemies will undoubtedly adapt to the capabilities described here, but simply affecting an enemy’s operations can have real value. Still, all of these capabilities are useless if the Navy does not have operational concepts for them. Without imagination and an innovative mix of art and science, the Navy will miss this opportunity to increase its combat power and, instead, give potential enemies a few more ways to bring parity to the world’s oceans. Unfortunately, the term “digital camouflage” is already in use to describe patterns on uniforms. The technology behind phased array optics is still several decades from reaching maturity.